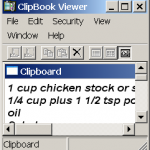 Andy Rathbone » Where’s the Clipboard Viewer in Windows XP? Where’s the Clipboard Viewer in Windows XP? For some reason, Windows XP messed up the Clipboard Viewer. It’s barely listed on the Help menus, and it isn’t installed automatically when you upgrade to Windows XP. Even when you tell Windows to install it from its CD, it doesn’t put a Clipboard Viewer icon on the menu. And that’s a shame, as the viewer is a handy way to see exactly what’s on your clipboard. Click the Start menu button and open My Computer. Scroll down the page until you locate a file named clipbrd or clipbrd.exe. When you open your Start menu, the Clipbrd program’s icon will appear near the top. To put a shortcut to that file on your Desktop, right-click the Clipbrd file, choose SendTo, and choose Desktop (Create Shortcut). Whenever you want to see exactly what’s being stored on your Clipboard, double-click on that icon. The Clipbook Viewer will appear, letting you peek at its contents. Note: Microsoft seems to have stripped the Clipbook Viewer of the advanced features found in older versions. You can’t “stockpile” multiple clips, for instance, or swap clips with networked computers. (The program’s Help menu still says you can do things things, oddly enough.) But if you just want to see what’s on your Clipboard, the stripped-down Clipbook Viewer works fine. Do you think that the XP clipboard interacts with the Office clipboard? I ask because (sometimes) my clipboard can’t update it’s contents with an image. I’ve highlighted a bit of text and used Ctrl-C to copy it to the clipboard. I use ALT-PrntScrn to capture an image. but when I try to paste the image the contents of the clipboard reverts to the text that I had highlighted previously. Deleting the contents of the clipboard (inside the clipboard viewer) does not help. Neither does killing all windows except the image and the clipboard viewer. I’m running XP 64 bit SP2, and I have Office 2000 installed. Thanks for that info. I have been wondering about that on and off for a few years. Thanks much. I’ve been kinda wodering about that. Thanks for being there when I need you. I can’t tell you how many times your blog has helped! Thanks hundredfold for this great help. I could not find info re clipboard anywhere else, even in windows documents. Your site is now in my ‘favorites’. Thank you so much Andy your instructions are very clear and easy to follow and I do appreciate that. to solve my PC problem to find the Clipboard ! Again many thanks ! Thank you so much. I was going crazy trying to find the clipboard. I kept trying to copy and paste and something and all I could get was a previously copied url. Without your help I would have been at a loss. I needed that clipboard viewer to delete the old url so I could copy new info. You are a lifesaver. This is not working for me. I don’t have folder; I have an “application” and it just gets hung up. My problem is periodically, I can no longer copy and paste (no way to clear the clipboard if you can’t find it). It somehow resolves mysteriously after a few days but I don’t know how. Any suggestions. We use XP and I have Office 2007. Our company won’t go to Windows 7 for a while. Suzanne, have you tried restarting your computer? That should clear the clipboard, letting you copy and paste again. Thank you for directions about how to put Clip board onto desktop. I had no idea how to do this. Your information was very specific and easy to understand. thanks a lot mr andy. i found the clipboard. I have windows 7 and this advice worked swimmingly. Thank you so much. Was translating from english to dutch and could not find were my translations went to. Faye: It sounds like you have an image on your clipboard, and Roboform’s bug department will only accept text. In that case, you won’t be able to paste the screenshot. You should contact Roboform and see if they’ll let you e-mail the picture as an attachment, instead. I get messages saying my clip board is full, but after following your instructions and going to the file, nothing is there. Pam, what’s the exact wording of the error message you’re seeing? And what version of Windows are you using? Malayanil, the file is indeed included with Windows XP Service Pack 3. However, if you bought your computer with Windows XP preinstalled, the manufacturer may have left out that file. You can even find the Clipboard Viewer file in the “Windows XP Mode” that’s installable through Windows 7. I’ve found clipboard but I cannot view my screeenshots. How can I view it? Sam, if you can’t see your screenshots with the Clipboard Viewer, then my guess is that your screenshots aren’t making it onto the Clipboard. thanks for that info I wish I had discovered earlier! I wanted to see atleast the last three items that I copied. I am seeing only one and if I copy again, the earlier text gets overwritten. Is this how this is supposed to work .. if so, how can I see a record of my last ten “CTRL-C” or copy actions? Shereen, Windows’ built-in clipboard can only handle one item at a time. If you need to see the last three things you’ve copied, you’ll need a clipboard program from a third-party. Thanks for this info Andy, I also have a periodic issue with Paintshop pro x5 in that i hit print screen and when i come to paste it get only a blank screen picture in black?? Brian: I’m not familiar with the Paintshop Pro x5 issue. I’m still using Paintshop 4 from 1996. It works fine with screen captures. The only only time I’ve seen problems with PrtScrn is when capturing videos. Some video cards do some tricks to accelerate the video, which keeps PrtScrn from working correctly. Why the #%&* would the wizards at ms require such an expedition to find the clip board? Thanks your simple explanation I’ve found it. 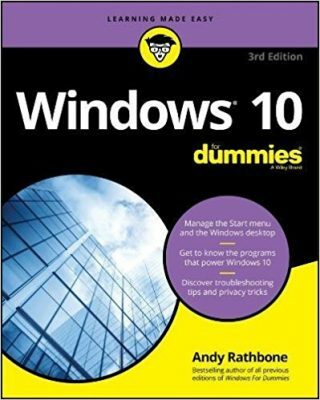 Cheetahkit: I wrote this article back in 2009 for people using Windows XP. It may be out of date for newer Windows versions or even for Windows XP. My XP machine in System 32 file only lists clip.exe When clicked (or double clicked) it tells me “Clip.exe is not a valid application.